Did you know that all staff and faculty along with their spouses have a free Ford Fieldhouse Health Club Membership right here at GRCC? Our Fieldhouse offers indoor/outdoor tracks, basketball courts, free weight room, swimming pool and a fitness/cardio room. Your membership also includes a storage locker, laundry/towel service. Take advantage of this fantastic benefit to being a part of GRCC! Blue365 is a program sponsored by participating local Blue Companies that helps you stay healthier, for less. Since 2007, Blue365 has offered discounts for members to save on products and services for a well balanced lifestyle. To view all current deals, please visit their webpage! Allegro Coaching offers GRCC Employees 15% off memberships - simply show your Raider Card! Packages are offered in 3 month, 6 month, or 12 month options with no enrollment fees. If you'd simply like to try a handful of classes, a punch card can be purchased at the discounted rate, which will give employees access to over 60 classes at either the Eastown or Kentwood locations and is valid for 120 days. Drop in classes are also available for $15 per session. Check out Allegro's website for the current class schedule. Additional questions? Call (616) 451-9000. Grand Rapids Community College employees can join G-FORCE Fitness with no commitments, no enrolment fees and no contracts to sign. They offer individual classes for $7 and group punch cards for one month for $35. They also have unlimited packages that you will receive $10 off per month as an employee. You will also receive 50% off flying yoga sessions. See flyer on right hand side for more information. 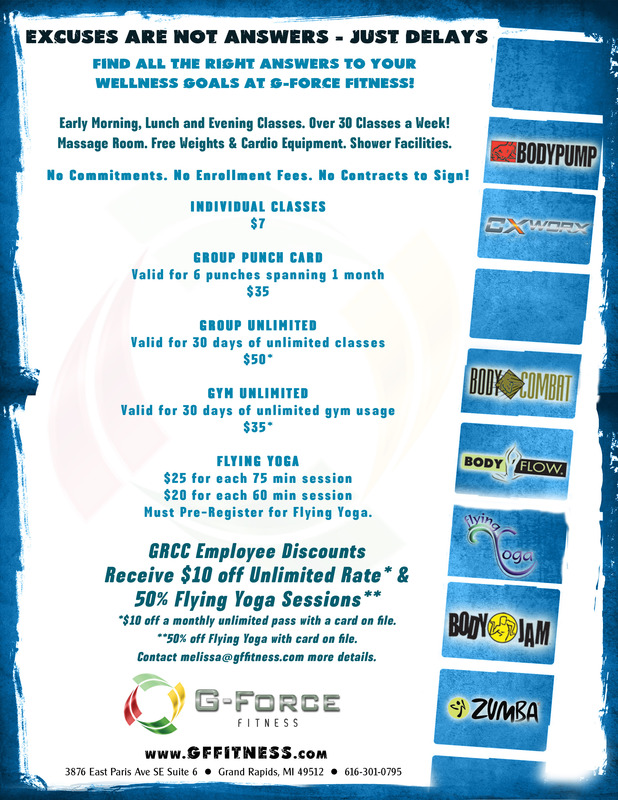 Check out G-Force Fitness to see their list of classes and current schedule. For additional discount information or general questions contact Melissa Cramer at (616) 301-0795. Student Life's Go See GR program was created to encourage current GRCC students and employees to experience Grand Rapids Museums and the John Ball Zoo at no cost. Staff Development is proud to sponsor and fund the cost of this program for employees. The cost of student admission is sponsored by Campus Activities. NOTE: GRCC employees will need to present their Raider Card and a GoSeeGR! voucher in order to be able to enter the attractions for free. The vouchers are available for pickup in the Student Life Office. Free general admission for current GRCC students and employees with RaiderCard and up to 2 guests. Grand Rapids Community College participates in Active Commute Week with the Greater Grand Rapids Bicycle Coalition. This week is ment to encourage active commuting either by bus, bike, walking and carpooling. To find out more visit the Greater Grand Rapids Bicycle Coalition. Lululemon Athletica in Grand Rapids offers FREE yoga every Saturday from 9 -10 a.m. All levels are welcome to attend these sessions that are focused on breath and movement. No reservations needed! Check out the lululemon mini-site for their free community offerings. For additional questions please call lululemon athletica at (616) 285-3228. Did you know that Michigan is the 16th fattest state in the country according to a new study? Only 15 other states are below us. By the year 2030, 3 out of 5 Michigan residents could be labeled as obese. The state of Michigan is taking this seriously and wants that to change. MI Healthier Tomorrow is a program that everyone can join that is educational and holds people accountable to lose 10% of their body weight in 2015. Think about taking the pledge to join others in losing weight and becoming healthier. We offer a discounted membership package for Grand Rapids Community College employees and their families through MVP Sports. An MVP membership is a great way to invest in your spirit, mind and body. MVP has developed an attractive corporate membership program that offers great incentives for joining. MVP offers Grand Rapids Community College employees and their families the Game Plan orientation session. MVP offers 4 locations in the Western Michigan area. One-week free guest pass can be used prior to joining. Game Plan orientation sessions with certified personal trainer to encourage daily activity, help achieve goals and enhance club usage through specific fitness programs. For additional membership package details contact Robert Phillips at (616) 254-8606 or rphillips@mvpsportsclubs.com. Grand Rapids Community College employees can enjoy discounts at SNAP Fitness! By presenting your RaiderCard, you'll receive 24/7 access to any of their nine locations in West Michigan with only $15 down and $30 per month. They also offer the option to prepay for a 12-month membership - only $345! Do you have a favorite SNAP location? Take advantage of their Home Gym discount which grants access to that location only for $20 per month. Visit their website for location information and contact Derek Beaudy at (616) 942-5600 or grandrapidsmi2@snapfitness.com with any questions.